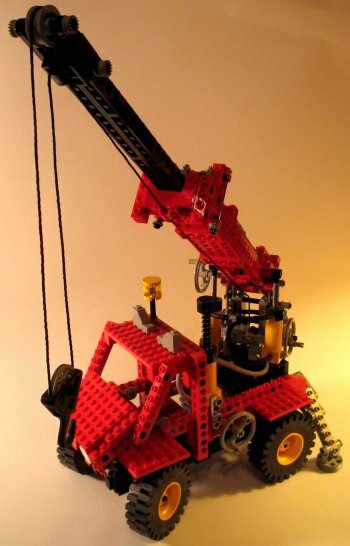 I finished building the Power Crane (8854) today. I think this one was Matthew’s, but I could be wrong. This is the last kit I have inventoried so far. It is a very neat kit. It does so many things: rolling, steering, pads raise/lower, crane pneumatic lift up/down, crane extend in/out, crane swivel left/right, and hook up/down. I also think the non-flash picture is cute too.Now I’ve got to go back and start inventorying the last few kits from the parts that I have, and I’ll be done with this “chore”. It not been my favorite thing to do. That is I wouldn’t go out and buy more kits to build and own. In other words, I wouldn’t be doing this unless I had this goal to organize our “family” Legos. But I have found that I’ve gotten a certain level of satisfaction that I now know that each kit is complete and buildable. After having sorted out thirteen different kits I have been building them to check if I selected the parts correctly. It took me several hours to build each of the following kits. 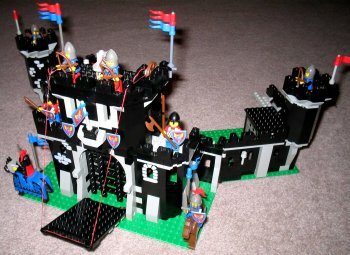 So here is the Black Knight’s Castle. 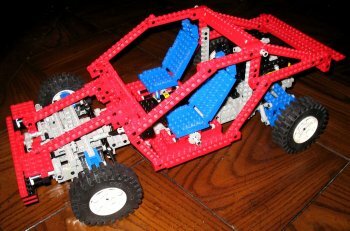 And the Auto Chassis It reminds of the great times we, the children and I, had putting them together. Now to break them down and put them back into their separate bags. You are currently browsing the Watt's Up blog archives for November, 2007.